For the first time, healthcare providers have an FDA-approved treatment procedure for raised seborrheic keratoses, also known as brown spots, small light brown spots on skin, wisdom spots, barnacles, lesions, or SK lesions, for short. Dr. Ron Shelton has undergone training for this in-office procedure, and is proud to introduce Eskata™ to his patients in New York City, and within the areas of Upper Manhattan. It is a high concentration of hydrogen peroxide that is directly administered over the brown spots of affected areas, thus, effectively reducing the frequency of such brown spots through a quick and easy in-office procedure. Throughout the duration of numerous trials and experiments leading up to its FDA approval, and in comparison to previous methods of treatment, ESKATA™ has garnered a reputation for its effectiveness in clearing up areas of non-malignant brown spots. 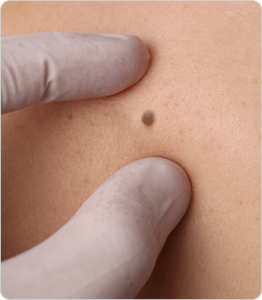 ESKATA™ is applied on a patient who has been examined and verified that they have a benign spot. Typically, the solution is administered over the lesion for a total of four times, with a device that bears many similarities to a pen, which is available at Dr. Ron Shelton’s practice. This highly concentrated liquid moistens the discolorations, thereby dissolving the spots without causing any damage to the skin around that area. Initially, patients may experience redness, swelling, and itching, however, in comparison to other treatment methods, such as freezing and lasers, ESKATA™ has been proven to be significantly less painful. Prior to the introduction of ESKATA™, dermatologists would use a laser or a scalpel to remove brown spots, and if such procedures were unsuccessful, they would freeze the discolorations. Unsurprisingly, those procedures were quite painful, and many patients would express their unwillingness and reluctance to participate in the treatment, as it involved the risk of being scarred. However, research has shown that ESKATA™ has minimal side effects when applied carefully over the lesions. What are these brown spots on your face? Read article at www.thenyac.com/brown-spots/ to understand.